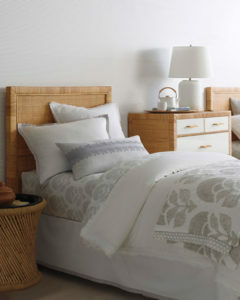 Twin beds are having a moment in design circles. 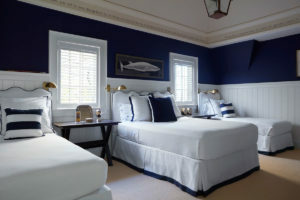 No longer relegated to kids’ rooms only, designers are using them in various configurations or in pairs to maximize sleeping quarters in guest rooms and more. Here’s a look at some of the newest designs that offer a double dose of style. 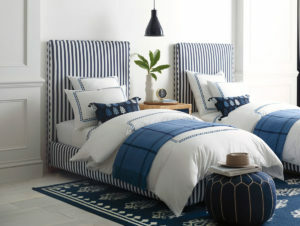 Inspired by a 1940s French Modern Chair and upholstered in an exclusive wisteria-ticking stripe, these Blythe Beds from Highland House generated a lot of “likes” at last spring’s High Point Market. The base has a simple carving and is available in any stain or paint. 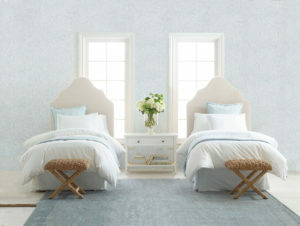 Thibaut showcases the design versatility of their Pagoda Headboard to suit a variety of design schemes. First up, Imperial Dragon, which highlights grand Chinoiserie dragons and florals in fashionable charcoal and yellow tones. Coordinating patterns in varying scale and complementary hues from the Dynasty Collection make it easy to mix and match. 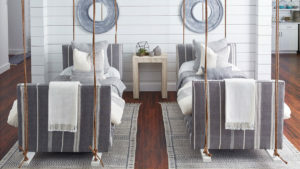 A white Prussia Quilt woven fabric and nickel nail-heads feels light, airy and modern: a perfect backdrop to the soothing gray and off-white tones of the Chestnut Hill Collection. 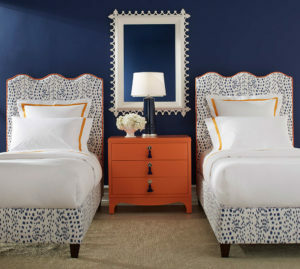 Here a Wave Platform Bed takes an eye-catching turn in a hip navy and orange combo. 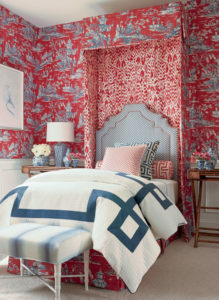 All furnishings and accents from Oomph, with featured fabric by Brunschwig & Fils – Le Touches. The Octavia is a beautiful go-to silhouette with simple lines and a sophisticated presence. Shown here in a classic Marine Panama Stripe. Furniture and accents from Serena & Lily. Rattan has the power to elevate things without a fuss. On the Balboa Bed, artisans start with a solid mahogany frame and achieve perfect texture by weaving the rattan to display beautiful variations in tone. 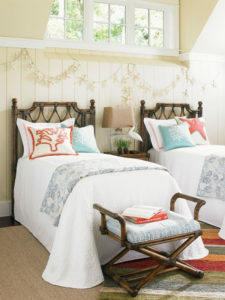 Furnishings and accents from Serena & Lily.